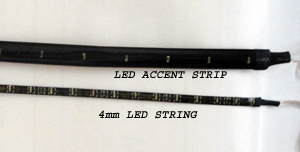 Several options from long 36" LED Strips, to multi pack 4 piece strips and new 8 piece LED Strings (only 4mm wide!). Strings/Strips use Hi-output wide dispersion flat LEDs molded into a flexable plastic strip to give more light and maximum flexability for installation. 3M brand adhesive allows the LED Strip to be mounted almost anywhere. Work on any 12 volt charging system- no battery needed! Available in 6 hot colors: red, blue, green, yellow, white & purple. Mount for added light on Cycles, Boats, RV's, snowmobiles and more! The all new Multi Pak Accent Strip LED light Kit utilizes Hi-output wide dispersion flat LEDs to give more light and maximum flexibility for installation. 3M brand two way adhesive allows the strip to be mounted almost anywhere. Work on any 12 volt charging system, with or without a battery. Strips can be cut with a scissor to desired length. If you want a switch, any standard low voltage (the cheap ones) will work fine. Just pick out the type you like (ie rocker, button, flip, etc. switch). Kit includes 2-12" strips, 2-8" strips (4 pieces total), mounting tape, and instructions. The all new 4 piece kit, (2) 12 inch & (2) 8" Accent Strip LED light Kit utilizes 40 Hi-output wide dispersion flat LEDs to give more light and maximum flexability for installation. 3M brand two way adhesive allows the strip to be mounted almost anywhere. Work on any 12 volt charging system, with or without a battery. Strips can be cut with a sissor to desired length. If you want a switch, any standard low voltage (the cheap ones) will work fine. Just pick out the type you like (ie rocker, button, flip, etc. switch). Kit includes four strips, mounting tape, wire, and instructions. The all new Mulit Pak Accent Strip LED light Kit utilizes Hi-output wide dispersion flat LEDs to give more light and maximum flexability for installation. 3M brand two way adhesive allows the strip to be mounted almost anywhere. Work on any 12 volt charging system, with or without a battery. Strips can be cut with a sissor to desired length. If you want a switch, any standard low voltage (the cheap ones) will work fine. Just pick out the type you like (ie rocker, button, flip, etc. switch). The all new Multi Pak Accent Strip LED light Kit utilizes Hi-output wide dispersion flat LEDs to give more light and maximum flexability for installation. 3M brand two way adhesive allows the strip to be mounted almost anywhere. Work on any 12 volt charging system, with or without a battery. Strips can be cut with a sissor to desired length. If you want a switch, any standard low voltage (the cheap ones) will work fine. Just pick out the type you like (ie rocker, button, flip, etc. switch). The all new Multi Pak Accent String LED light Kit utilizes Hi-output wide dispersion flat LEDs, on a super thin 4mm wide strip to give more light and maximum flexability for installation. 3M brand two way adhesive allows the strip to be mounted almost anywhere. Work on any 12 volt charging system, with or without a battery. Strips can be cut with a sissor to desired length. If you want a switch, any standard low voltage (the cheap ones) will work fine. Just pick out the type you like (ie rocker, button, flip, etc. switch). Kit includes 4-12" strips, 4-8" strips (8 pieces total), mounting tape, and instructions.